Bowls are used in everyday life for holding food, fruits, liquids or other items. Our exclusive range of wooden bowls, decorative bowls, carved decorative bowls, bowls, wood bowls, kitchen utensils, kitchen utensil, steel cutlery, stainless steel cutlery and glass bowls represent the interesting mixture of beauty and utility. Heavy Duty Cast iron drinking bowl for livestock's. Two hole fixation duly milled for pipe or wall mounting. Stainless Steel tongue avoid rust and easy pressure for water flow quantity of 8 - 10 litres / minute. Powder Coated. Most ideal for cattle and horses. 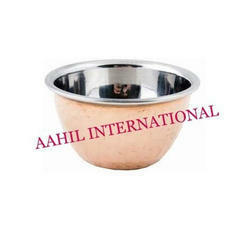 Keeping the diverse requirements of customers in mind, we are instrumental in providing Automatic Drinking Bowl.